These are hands-down the best blades on the market. They are well-balanced and light, truly high-performance grade. They bend in all the right places and feel great in your hand. These are my personal favorites and I will absolutely use a BF blade over anything else whenever possible. They’re a little more expensive but they’re worth it. There are some very slight differences between the “blues” and the “whites” but they are both top notch. In my experience the whites tend to be a little lighter and a bit less durable than the blues but it’s not a huge difference by any means. Both tend to last a complete season of training and competing before breaking. I’ve just had one or two whites (out of many) that got a kink in them early on that never quite came out, leading them to break a month or two earlier than the blues I bought at the same time. I would recommend just being a little more careful with the whites (if you have that luxury) in your first few practices with them to develop a healthy natural bend. This seems to help prevent those kinks from getting there in the first place. Heck even with the kinks I had in those blades, they were my personal favorites that season. 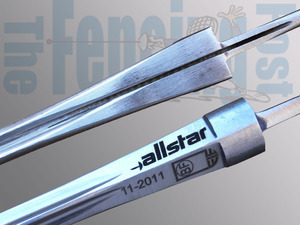 BF (Blaise Freres) makes the blades in France and brands them for the various companies (Uhlmann/Allstar). In a sense you get an extra set of eyes doing quality control as the blades make their way through the various companies. The down side is that the middle man increases the price a bit. It turns out that since these are currently the best blades on the market and shipped over from France rather than a larger scale Chinese factory, they are often difficult for the vendors to get ahold of. In short, whether it’s branded as Uhlmann or Allstar doesn’t really matter. Just go with whichever one the vendor has in stock when you’re buying. Have you compared BFs after the forge changed hands to the good ones from, e.g., 2011 like the one pictured above? The newer ones are generally better quality. Plus it’s easier to differentiate the blades in terms of stiffness straight from the forge.